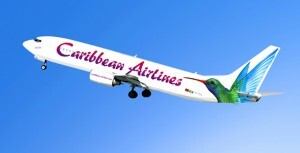 [GuardianTT] – Despite losing its fuel subsidy in the 2013-2014 budget and being mandated to achieve financial viability, state-owned Caribbean Airlines is still listed in certain budget documents to receive a $400.7 million subsidy from the Government. Trinidad’s Finance Minister Larry Howai also confirmed the figure yesterday, saying it was to facilitate the airline’s restructuring process. During Monday’s budget presentation, Howai had said CAL must move towards the adoption of a financially sound business model for positioning the airline in targeted segments of the global tourism market. Howai said the new CAL board—under Phillip Marshall—had completed the first phase of a revised business plan for the airline to achieve financial viability. To this end, Howai had said he proposed to discontinue the fuel subsidy which CAL currently enjoys—and had been the cause for much complaint by regional islands in recent months. The subsidy for the Tobago airlift will remain, Howai had said. In his budget presentation, Howai said these factors had been incorporated into the business plan, which he expected to receive from the CAL board by September 17. He told the public, however, that he had been assured by the CAL board that the removal of the fuel subsidy will not impact on the ticket pricing policy. However, in one of the 11 budget documents—the 2013-2014 draft estimates of recurrent expenditure—under the heading of the Finance Ministry, there is a listing for a transfer of $400,760 million for CAL in 2014 estimates. It is, however, a decrease over the 2013 estimates for the airline, which was $527.3 million. During a Senate break yesterday, Howai told the T&T Guardian that the $400.7 million was capital for restructuring. Saying it was “an approximate value,” Howai said it was not a final figure and could be changed when he obtained CAL’s final report. He said the report has to be examined by Finance Ministry officials and CAL will also be doing some cost-cutting. Also included in the Finance Ministry’s estimates is a debt servicing figure of $719 million for CAL. Other figures in the document confirmed the ministry is also still tying up BWIA issues in a handful of areas.